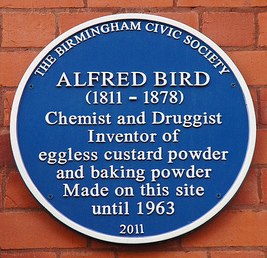 Alfred Bird is undoubtedly most famous in the modern day for the creation of eggless custard and the subsequent development of the ‘Bird’s Custard’ company- Alfred Birds and Sons Limited. However, Bird was much more than this, he was in some respects the archetypal Birmingham food manufacturer (along with the likes of John Sumner of Typhoo Tea, John Cadbury of Cadbury’s and their respective families); an experimental, philanthropic and forward thinking man. Born in Nympsfield in Gloucestershire, Alfred Bird served an apprenticeship with Phillip Harris and Co. of Digbeth, a reputable chemistry firm, and opened his own shop on Bell Street (roughly in the middle of the modern Bullring Shopping Centre) at the age of 24 in 1837 with a sign reading ‘Alfred Bird F.C.S (Fellow of the Chemists Society)- Experimental Chemist’. The wording of this sign gives an indication of Bird’s ambition and passion; it was as a result of after-hours experiments that he would make his name and fortune. Bird’s wife Elizabeth suffered from digestive ailments- yeast intolerance and an egg allergy. Attempting to provide some relief for his wife, Bird first invented what is now known as Baking Powder (then called Bird’s Fermenting Powder) in 1843. Soon afterwards, he developed his cornflour-based custard substitute. Word of the invention spread rather rapidly and Bird’s Custard quickly became very popular around Birmingham. This was not the case with Bird’s Fermenting Powder but in response to this Alfred Bird did something that would become the hallmark of his company; he initiated a ground-breaking advertising campaign. Bird issued a calendar extolling the virtues of his product, supposedly the first use of free calendars in advertising. Demand increased and by 1847 the business moved to a bigger space on Worcester Street (approximately where Smallbrook Queensway is today). The company went from strength to strength and by 1850 Bird’s two products were distributed nationally, in 1855 he convinced the War Department to allow him to supply his Baking Powder to troops in the Crimea. Bird began advertising in the Illustrated London News in 1855 and four years later produced a colour lithograph showing Bird’s Custard being used on the ill-fated Franklin Expedition. In 1849 Elizabeth Bird gave birth to a son that was christened Alfred Frederick Bird. Initially it was intended for Alfred Jnr to enter into the legal profession but he inherited his father’s passion for experimentation and innovation, as well as his skill with advertising. The philosophy of the Bird family is summed up in the motto that hung on the wall of the Worcester Street store: Early to Bed Early to Rise, Stick to your Work and Advertise. Although it was clearly in food manufacturing and advertising that Alfred Bird Snr excelled at, it is important to remember that he experimented in other areas and was rather a ‘Renaissance man’. 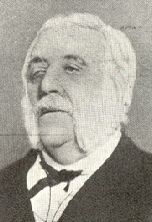 Alfred Snr also invented a musical instrument (the ‘Musical Glasses’- principally similar to the party trick of rubbing the rim of varyingly filled glasses to produce a note), a water barometer, a comparatively safe and easy to use oil-based nightlight, a type of railway signal and a novelty water jet which he placed in the window of his store to draw in customers. As Alfred Jnr grew up and joined the family business, he displayed a similar aptitude for mechanics, installing machines that assisted in the packing of custard and baking powder. Bird’s is no longer a family business and production in Birmingham has ceased but Devonshire House, the factory run by Alfred Jnr in Digbeth, has been redeveloped into the ‘Custard Factory’, a centre for design and creative arts and a link between Birmingham’s past, present and future. Foley, John. The Food Makers: A History of General Foods. Banbury: General Foods Ltd. 1972. Proceedings of the Institution of Mechanical Engineers. Birmingham: Institution of Mechanical Engineers, 1854.